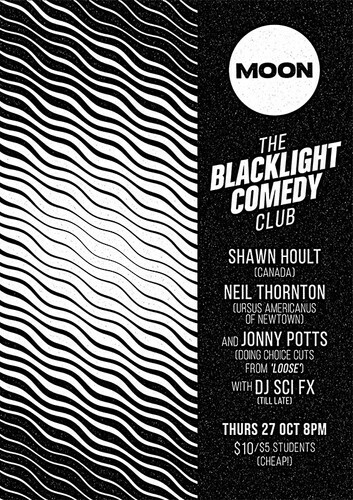 Newtown's Blacklight Comedy Club returns for its 12th outing. This month, Canadian Shawn Hoult and American import Neil Thornton present long sets and regular host Jonny Potts performs choice cuts from his award-winning solo show 'Loose: A Private History of Booze and Iggy Pop 1995-2016'. Come see three of the capital's best comedians for a price so low you'll have to look twice. As always, DJ Sci-FX will be playing the best tunes you ever heard - plus a lot you've never heard - till late.